Yes, I’m back… hopefully on a regular basis. I’ve been MIA since my Mother passed away in April from ALS. It’s taken time to put the pieces together and let go of the anger enough to formulate coherent thoughts that others may actually want to read. That said, I spend each day home with 8 children aged 9 and under which helps distract me. There are many hours in a day and that becomes apparent when you spend that much quality time together! I’ve been putting together some ideas to help us break up the day. Apparently, these kids can only spend so much time riding bikes and climbing the cherry tree. I’ve decided to share activities we enjoy in the hope they may save you the hair pulling experiences I have had. We have many ideas, so they will be broken up into a several part series. Hopefully, you can implement some of them in your daily routines and perhaps even leave a comment or two with your favorite activities! As always, our activities focus on being outside, exploring nature, family time, conservation, reuse and safety! Water Play: I put out a shallow tote (a clear plastic under bed storage bin about 6-8 inches deep by a couple feet long and wide) with warm water, a couple drops of natural dish soap and lots of measuring cups, bowls, spoons and any other pouring device we can find. (If you are really adventuresome, add a few drops of a natural food color like India Tree.) We do this on the deck so the water mess stays outside. This is perfect for an afternoon that isn’t quite warm enough for the sprinkler or wading pool and occupies the little ones for hours. Even my 9 yo’s enjoy getting in on the fun, although they’ve been known to dump water on everyone else. Rock Painting: The first step is to take everyone on a rock gathering expedition. Look for smooth rocks of various sizes. Once you are back home, bust out the water play tub again so that everyone can wash their rocks. Once they are washed and dried (leave them sitting in the sun in a dry area while everyone has lunch or a snack), gather your paint supplies. We lay out an old sheet or drop cloth and everyone sits cross legged on the ground. At first you may need to help with suggestions (ladybug, polka dots, stripes, spider, frog) but overtime you may be surprised at some of the creative ideas the kids come up with. If you want to maintain your painted rock for a long period of time, spray with a sealer once they are dry. Now you can decorate the garden, yard and flower pots. Remember to always look for items you might be able to use later. When you are on nature walks, collect rocks, twigs, leaves, flowers, etc… Save egg cartons, milk jugs, fabric scraps, mis-matched socks and other household odds and ends. You never know what may come out of a pile of scraps! The photo? That’s my little Kelsey Anne, age 4. 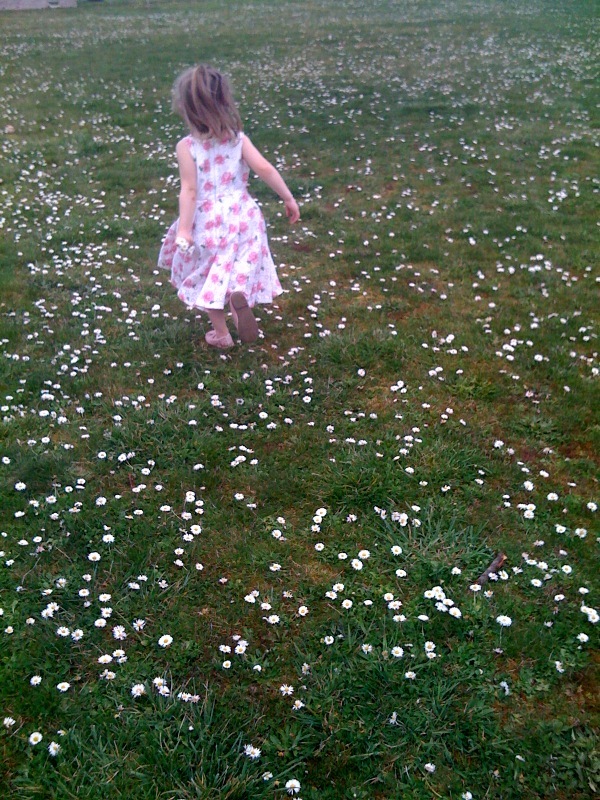 We spend considerable time running through the field, picking daisies to make chains out of and dancing in circles.